You may know it… they play it on the radio all the time. It’s been one of my fav songs for a while. Sitting in church, I was a bit overwhelmed by the message. You see, I was very tired. It’d been a hard week, my sweet Annabelle’s health in the balance. She wasn’t sleeping well either, which means Mommy hadn’t gotten sleep either. I was tired and feeling very worn. And then we sang that song. As the words came thoughtlessly out of my mouth, the reality of what I was singing kinda hit me. But in this song, we’re ASKING God to take us scary places. We’re asking him to lead us to a place where we would never choose to go ourselves. We’re asking him to lead us where our trust is without borders. In order to trust… there has to be something happening that we cannot handle ourselves. No borders means with everything, no matter the circumstance. Sitting there, my mind drifted to my sweet three year old. We were going back for labs the next day to determine if she was getting worse or better. Her bone marrow was refusing to make red blood cells. The word “bone marrow” associated with any kind of problem with your child is enough to send any mother freaking out. So, I’m sitting there singing this song, asking God to make me trust him more… to take me deeper than I can handle… to stretch my faith further…. And part of me called myself all kinds of a fool. Really? Let’s CLAIM healing, Krista. Plead with God for your childs health, not ask him to rock my world and stretch my faith…. But another part of me chimed in, the one that remembers the 10 long months sweet Annabelle was in the hospital, the one that remembers how God was with us EVERY step of the way… that part of me knew that God was preparing my heart. I needed to trust Him no matter what the next day brought. I’d gotten in a bad habit of leaning on my own strength lately, of trying to be MOMMA, HEAR ME ROAR instead of daughter of Christ who leans on her Savior’s strength. And you know what? We had a fabulous rest of the day. I had this inward peace that I can’t really explain. Annabelle was happy and in a decent mood, and it was just a good day. We went to clinic the next morning, and Annabelle did great. Cried at the blood draw less than usual. Was smiling at the doctors, and even said “Dr. Dodd” (her cardiologist) for the first time! It was so cute!! On the way home, I was even more confident. I could trust God, and it was all going to be okay. While I truly believed my daughter was just fine… I told God that no matter what, I’d trust him. I wasn’t alone. Annabelle wasn’t alone. Our family wasn’t alone. A few hours later, the nurse called. 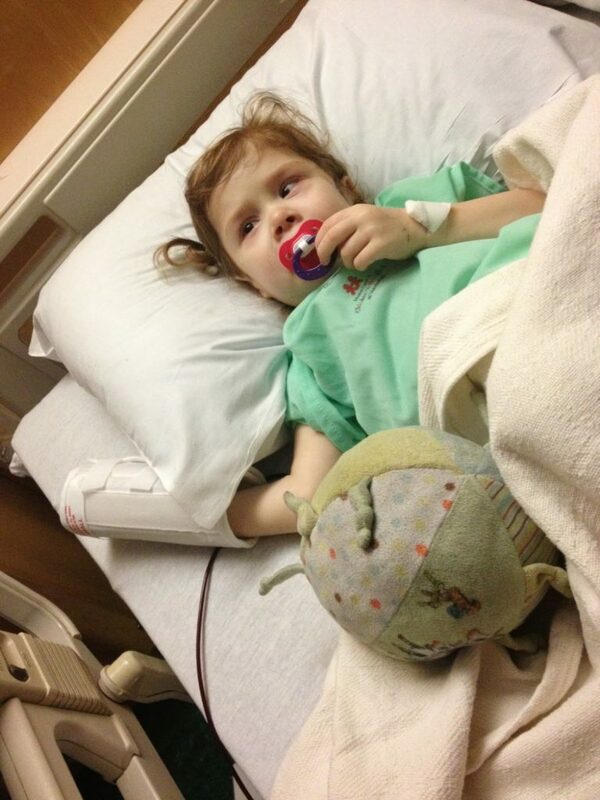 Her levels were much worse, and they needed her to come in and get a blood transfusion. They were consulting some other doctors to see their thoughts, but right now she needed blood very soon, since she was dropping levels at such a rapid rate. NOT what this Momma wanted to hear. But you know what? I was okay. My heart hurt for my sweet girl, and I wasn’t really to the REJOICING part yet, but I truly feel like God had prepared me. Instead of losing it like I have a habit of doing lately, I felt a divine strength that I KNOW was not from me. 24 hours later, we returned home after 2 blood transfusions, but I still have to take my princess back this morning for repeat labs, as her levels weren’t anywhere near “normal” when we left, and it is still in question if her bone marrow has started to kick in yet. I want to say I’m at this fabulous point of trusting. But I’m still a work in progress. I still shutter at the word “bone marrow.” I do know, though, that whatever may come, good or bad, Jesus is with us every step of the way. Because God is calling us out upon the waters. It is a great unknown. But even in oceans deep, our feet will stand, when we call on God’s name.